As most of you know by now, I'm not one for pretentious, fussy cakes. A buttermilk base, kiss of lemon and just enough salt to keep things sophisticated make this unpretentious beauty my go-to seasonal cake recipe. 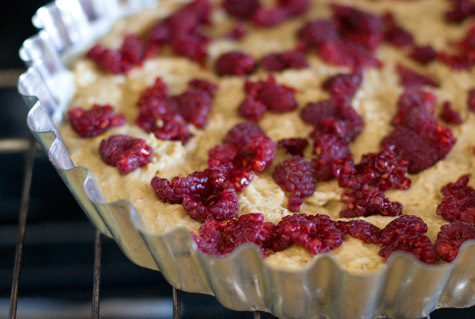 It's the kind of cake you can throw together on the fly using whatever berries or fruit are in season - in this case raspberries. I love the way smashed berries bleed into the sugar-crusted top of this cake, but there is no reason you couldn't do something like brown-sugared, sauteed apples later in the year. 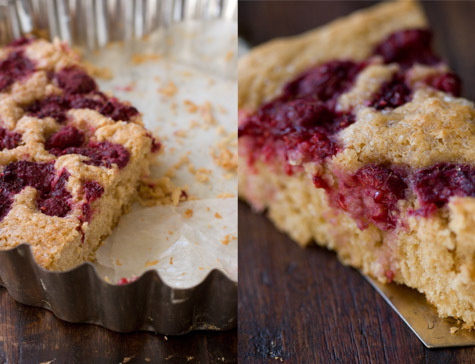 The whole wheat pastry flour I use delivers a pretty cake with delicate crumb. And the buttermilk lends plenty of richness and flavor allowing me to use a fraction of the butter and sugar you'll find in many cakes. One of the hallmarks of this cake is the big sugar crystals that are strewn across the top just before baking - along with big salt crystals. The cake bakes at a high temperature and the sugar and salt get nice and crusty. The cake itself isn't particularly sweet, so getting a kick of salty sweetness from the crust is key. Now I recognize that not all of you have XXL grain salt and sugar on hand - it's not the end of the world, you can use regular table sugar, though you'll miss out on the craggy texture. I'd skip the finishing salt altogether if you only have a fine-grain table salt - it's still good. I melt the butter for this cake, so sometimes while I'm at it I just keep going and brown it - this adds an entirely different deep buttery flavor. If you go this route, strain out any solids and let the butter cool a bit before stirring it into the egg-buttermilk mixture. As I mentioned up above - feel free to experiment with other types of seasonal berries and fruit. The coup de grace is a floppy dollop of sweet, freshly whipped cream on the side. Preheat oven to 400F degrees, racks in the middle. Grease and flour (or line bottom with parchment paper) one 11-inch tart/quiche pan. Alternately, I've done this cake in a 9x13-inch rectangular baking dish - just keep a close eye on it after it has been baking for 20 minutes. Combine the flour, baking powder, and sugar and salt in a large bowl. In a separate smaller bowl whisk together the eggs and the buttermilk, whisk in the melted butter, and the lemon zest. Pour the buttermilk mixture over the flour mixture and stir until just combined - try not to over mix. Spoon the batter into the prepared pan, pushing out toward the edges. Now drop the berries across top. I like to smush them a bit between my fingers before letting them fall to the cake - no so perfect looking and the juices meld with the sugar. Sprinkle with the large grain sugar and then the salt. Bake for about 20-25 minutes or until cake is set (or a toothpick in the center comes out clean), and a touch golden on top.